Nevertheless, Franken refuses to even consider resigning, and when asked about stepping down, he dutifully refers to a senate ethics committee looking into this. What exactly the ethics committee will need to look into when there is a photo of Franken clearly groping Leeann Tweeden’s chest while she is asleep, Franken doesn’t explain. Also inexplicable is what the ethics committee is supposed to make of the fact that Franken does not deny groping the butts of three other women, all of whom claiming they were grabbed while Franken was either a senator or running for the senate. Franken appears to have spent much of his Thanksgiving holiday with handlers attempting to figure out a way to deny the accusations without calling his accusers liars. Murphy was having none of that. At this point Franken interrupted to talk over the allegation that he “forcibly kissed her,” an allegation Franken denies. 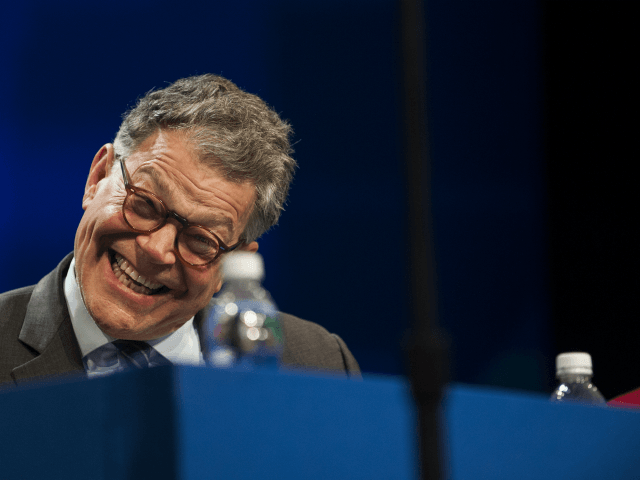 Two of the accusers claim they were groped at campaign events in support of Franken.